1. a positive copy of an object. 2. to make such a copy. 3. a mold of a tube or hollow organ (such as a renal tubule or bronchiole), formed of effused matter and eliminated from the body. See also urinary cast. 4. a positive copy or mold of the tissues of the jaws, made in an impression, and over which denture bases or other restorations may be fabricated. 6. a stiff dressing or casing, usually made of plaster of Paris, used to immobilize body parts. Patient Care. If the patient is confined to bed after a plaster of Paris cast is applied, it is necessary to provide a firm mattress protected by a waterproof material. Several small pillows should be available for placing under the curves of the cast to prevent remolding or cracking of the plaster and to provide adequate support of the patient. When handling a wet cast only the palm or flat of the hand is used so that the fingertips will not make indentations that might produce pressure against the patient's skin. While the cast is drying it is left uncovered to allow circulation of air around it. Extreme heat should not be used to hasten drying of a plaster of Paris cast, as this may produce burns under the cast. Synthetic casts, however, may be set or cured with heat. To minimize crumbling of the edges and irritation of the skin around and under the cast, a strip of stockinette or adhesive tape is applied so that the rim of the cast is thoroughly covered. Observation of the patient for signs of impaired circulation, pressure against a nerve, or compartmental syndrome is extremely important. Any numbness, recurrent pain, or tingling should be reported at once. 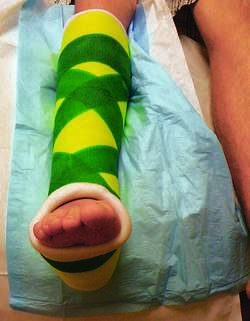 If a limb is enclosed in a cast it should be elevated to reduce swelling. Cyanosis or blanching of the fingers or toes extending from a cast usually indicates impaired blood flow, which may lead to serious complications if not corrected immediately. renal cast (urinary cast) a cast formed from gelled protein precipitated in the renal tubules and molded to the tubular lumen; pieces of these casts break off and are washed out with the urine. Types named for their constituent material include epithelial, granular, hyaline, and waxy casts. In renal disease, casts may be seen containing red or white blood cells. walking cast a lower extremity cast with an attached heel or other support so that the patient is able to ambulate while the cast is in place. 1. An object formed by the solidification of a liquid poured into a mold. 2. Rigid encasement of a part, as with plaster, plastic, or fiberglass, for purposes of immobilization. 3. An elongated or cylindric mold formed in a tubular structure (for example, renal tubule, bronchiole) that may be observed in histologic sections or in material such as urine or sputum; results from inspissation of fluid material secreted or excreted in the tubular structures. 4. Restraint of a large animal, usually a horse, with ropes and harnesses in a recumbent position. 5. In dentistry, a positive reproduction of the form of the tissues of the upper or lower jaw, which is made by the solidification of plaster, metal, or other materials, poured into an impression and over which denture bases or other dental restorations may be fabricated. 1. a positive copy of an object, e.g., a mold of a tube or hollow organ, formed of effused matter such as fat or cellular debris and later extruded from the organ, such as a urinary cast. 2. a positive copy of the tissues of the jaws, made in an impression, and over which denture bases or other restorations may be fabricated. 3. to form an object in a mold. 4. a stiff dressing or casing, usually made of plaster of Paris, used to immobilize body parts. dental cast see cast (2). hanging cast one applied to the arm in fracture of the shaft of the humerus, suspended by a sling looped around the neck. 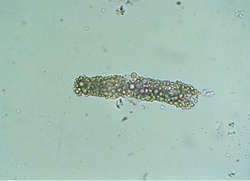 renal cast , urinary cast one formed from gelled protein in the renal tubules, molded to the shape of the tubular lumen. 1. A rigid dressing, usually made of gauze and plaster of Paris, used to immobilize an injured body part, as in a fracture or dislocation. 2. 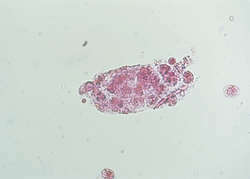 A mass of fibrous material, coagulated protein, or exudate that has taken the form of the cavity in which it has been molded, such as the bronchial, renal, or vaginal cavity, and that is found histologically and in urine or sputum samples. 1 a stiff, solid dressing formed with plaster of paris or other material around a limb or other body part to immobilize it during healing. Kinds of casts include the body jacket, long-arm cast, long-leg cast, short-arm cast, short-leg cast, and spica cast. 2 a mold of a part or all of a patient's teeth and internal jaw area for fitting prostheses or dentures. 3 a tiny structure formed by deposits of mineral or other substances on the walls of renal tubules, bronchioles, or other organs. Casts often appear in samples of urine or blood collected for laboratory examination. 4 the deviation of an eye from the normal parallel lines of vision, such as in strabismus. Medtalk A mold of formed structure or wall. See Decidual cast Nephrology A translucent proteinaceous mold of the renal tubules seen in the urine; casts are ↑↑↑ in renal disease, and the types are crude indicators of the type of renal disease; the matrix of all casts is composed of albumin, small–< 50 kD globulins and glycoprotein secreted by Henle's ascending loop and the distal tubule, forming Tamm-Horsfall protein, aka uromodulin. See Granular cast, Telescoped cast, Waxy cast Orthopedics A temporary plaster or fiberglass device used to immobilize a Fx. See SPICA cast, Walking cast. Cardiology A clinical trial that examined the effects of suppressing asymptomatic/mildly symptomatic ventricular ectopic beats and arrhythmias in post-MI Pts with CAD using encainide and flecainide. See Arrhythmias, Encainide, Flecainide. Cf BASIS, CASCADE, CAST II, Moricizine. 1. 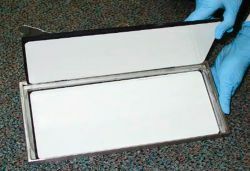 An object formed by solidification of a liquid poured into a mold. 2. Rigid encasement of a part, as with plaster, fiberglass, or plastic, to immobilize (e.g., long-leg cast, short-leg cast) a fractured bone. 3. An elongated or cylindric mold formed in a tubular structure (e.g., renal tubule, bronchiole) that may be observed in histologic sections or in material such as urine or sputum; results from inspissation of fluid material secreted or excreted in the tubular structures. 4. dentistry A positive reproduction of the form of the tissues of the upper or lower jaw, formed by pouring gypsum or metal into an impression of the tissues, allowing it to set, and then removing the impression. Resulting structure provides a base on which dental restorations may be fabricated. 1. 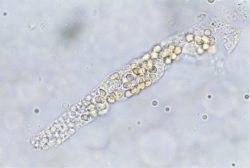 An abnormal moulded shape, corresponding to the inside of a kidney tubule or a small air tube in the lungs (bronchiole) formed when excreted material such as protein or mucus solidifies in situ. 2. A supportive shell of bandage-reinforced Plaster of Paris used to immobilize fractures during healing. A negative form or replica of the anterior part of the eye. A substance with rapid gelling properties is held in contact with the eye until gelled. This impression (or mould) is then used in the preparation of a positive model called a cast (or casting) of the anterior part of the eye: it is made by filling the impression with a material containing a plaster of Paris base which hardens to artificial stone. Using this cast a shell of a scleral contact lens is produced with optimum shape of the back surface. Syn. impression; impression moulding; mould; ocular impression. 1. In dentistry, a positive reproduction of the form of the tissues of the upper or lower jaw, which is made by the solidification of plaster, metal, or other materials, poured into an impression and over which denture bases or other dental restorations may be fabricated. 2. An object formed by the solidification of a liquid poured into a mold. 3. Rigid encasement of a part, as with plaster, plastic, or fiberglass, for purposes of immobilization. n 1. an object formed by pouring plastic or liquid material into a mold in which it hardens. v 2. to throw metal into an impression to form the casting. n See splint, cast bar. n a dental cast that has been modified by the correction of the edentulous ridge areas as registered in a supplemental, correctable impression. n a positive likeness of a part or parts of the oral cavity reproduced in a durable hard material. n a positive likeness of dental structures for the purpose of study and treatment planning. n the section of a finished cast that contains the actual impression of the teeth and surrounding tissue. It should account for approximately 65% of the cast's total height. n a cast made from a conventional mucosal impression on which the wax trial denture and surgical impression trays are made or selected. n a cast of the teeth trimmed so that the occlusal plane is in its normal position in the oral cavity when the cast is set on a plane surface. Such casts are used in the gnathostatic technique of orthodontic diagnosis. n a positive reproduction of the exposed bony surfaces made in a surgical bone impression and on which subperiosteal implant frame is designed and fabricated. n the process of forming the base (or capital) of a cast so that it can be remounted accurately. Also referred to as the split-cast method of returning a cast to an articulator. n an accurate replica of the prepared tooth surfaces, residual ridge areas, or other parts of the dental arch reproduced from an impression from which a prosthesis is to be fabricated. n a reproduction of all or part of the oral cavity, which is then attached to a support for ease of display. n a cast made before the extraction of teeth. See also cast, diagnostic. n a positive replica of the dentition and adjoining structures, used as a reference for conditions existing at a given time. n a cast made of materials that can withstand high temperatures without disintegrating and that, when used in partial denture casting techniques, expand to compensate for metal shrinkage. n a set of finishing steps for a study cast in which the bases, posterior borders, sides, heels, and anterior surfaces are smoothed and shaped to ensure a finished product that is attractive, well proportioned, and useful as a diagnostic tool. The treatment is best accomplished using a mechanical model trimmer. n an accurate reproduction of a master cast; used in preliminary fitting of a casting to avoid injury to the master cast. 1. a positive copy of an object, e.g. a mold of a hollow organ (a renal tubule, bronchiole, etc. ), formed of effused plastic matter and extruded from the body, as a urinary cast; named according to constituents, as epithelial, fatty, waxy, etc. 2. a restraint procedure used in horses and cattle, and occasionally in large beasts such as elephants, to pull them to the ground so that surgical procedures can be performed. Used less nowadays than previously because of the advent of new anesthetic techniques. There are many techniques and special harnesses for special purposes. 3. an animal lies down but is unable to right itself into a position of sternal recumbency so that it can rise, e.g. a horse in a loose box when it is lying too close to a wall, a sheep in heavy fleece in wet weather. When helped to the sternal posture the animal is able to rise. 4. to form an object in a mold, as a replica of teeth made in an impression. 5. a stiff dressing or casing, usually made of plaster of Paris, used to immobilize body parts. More modern, lightweight casts are made of polyurethane resins. 7. culled, e.g. cast for age. 8. shedding of velvet by deer stags and bucks. a rigid material, usually plaster of Paris, is applied from the toes to as high as possible over the humerus or femur. Used for immobilization of fractures of the radius, ulna or tibia. a reproduction of the jaw and dentition made from powdered gypsum stone and water in an impression mold. precipitates of mucoprotein or plasma protein in the shape of the renal tubular laminae in which they form, often with cellular elements. 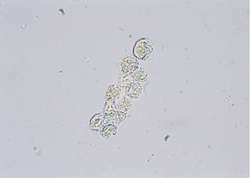 Observed in the examination of urinary sediment, they indicate renal tubular or epithelial damage. 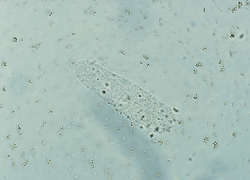 Hyaline casts are composed of mucoproteins or plasma proteins without formed cellular elements. Waxy, granular, epithelial, erythrocyte and leukocyte casts may occur, each representing a type of cellular reaction or stage of degeneration within the cast. Fatty casts are formed from degenerating tubular epithelial cells and, particularly in cats, lipid in these cells. 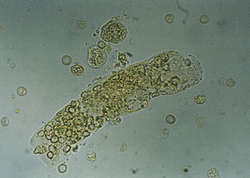 Casts may dissolve in alkaline urine. Called also cylindroids. one that does not extend above the elbow or stifle, thereby permitting movement of those joints so that the animal can walk on the leg. Suitable for fractures of the metacarpus or metatarsus.